This picture is taken from the Problem Pictures CD-ROM of photographs with activities for mathematics teaching. 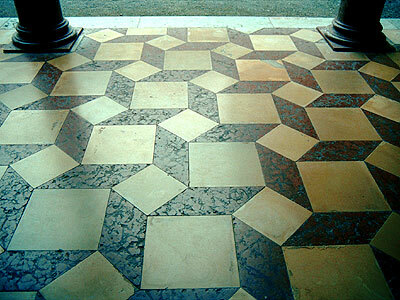 This tiling consists of squares and parallelograms. The large squares each have an area of 1 square meter. The angle between the large squares and small squares is 45 degrees. What is the area of one of the small squares? What is the area of one of the parallelograms? The photograph was taken in Germany. The photographs and screen images on this website are copyright and may not be reproduced without permission. Copyright © Richard Phillips 2001/2008. Page updated 27 November 2008. Keywords: photo math photos photo maths photos mathematical photos mathematical photographs.